imagined. I think some of the cyclists are envisioning a blue highway, but I don't see it this way at all. Have you spent much time on uneven glare ice? 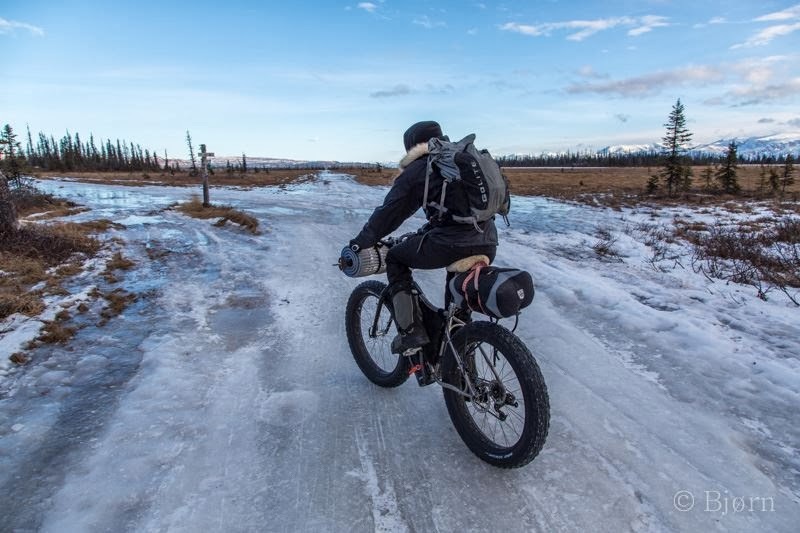 Such trail conditions were rather common when I lived in the freeze-thaw cycle of Juneau. Even with microspikes or studded tires, that @$%! is sketchy. And the Alaska wilderness is not a convenient place to end up with a concussion. Not to mention all of the open creeks that are usually covered in snow bridges. 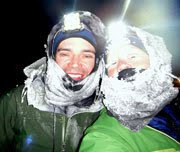 No snow and 30 below is entirely plausible on parts of the route, and I try to imagine what that might be like. The surface of Mars comes to mind. Tonight I compiled and packed my two drop bags for the Iditarod. Handling, and the inevitable sampling, of 25,000 calories of junk food is always enough to make me strongly question my life choices. I did keep the selection pretty simple. 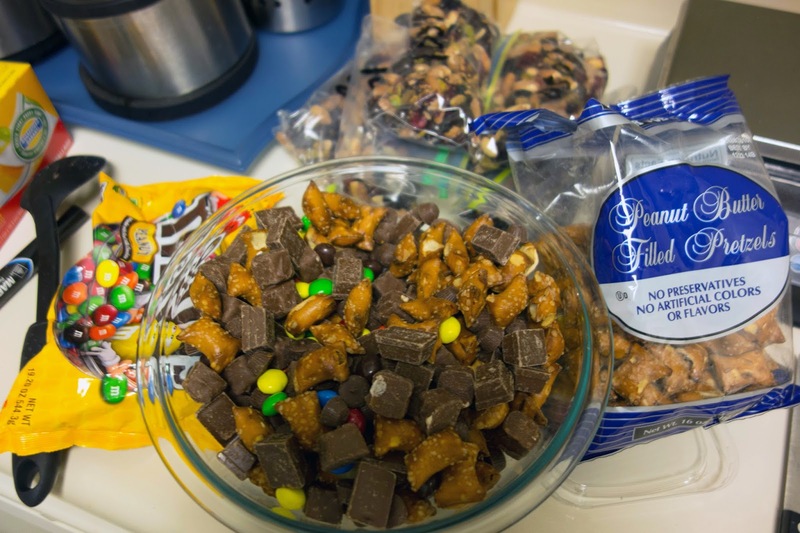 A trail mix of dried fruit and salty nuts, a "high-octane rocket fuel" mix of candy, gummy snacks, crackers, peanut butter, and two freeze-dried meals. I have a deeply entrenched fear of running out of heat-making fuel in extreme cold, and I wanted to take the maximum number of calories of foods I know I can actually eat. Because I'm limited to ten pounds per drop, including some drugs and a few other miscellaneous items, 25,000 was what I could manage. I figure this will be my food supply for the last 220 miles and five to seven days. This will be somewhat supplemented by lodge and checkpoint food. It's also quite likely I'll be able to scavenge rejected food as one of the last racers on route, but I feel uncomfortable banking on anything out there (you can't count on anything, so you have to plan for everything.) Anyway, I feel comfortable enough with 25,000. I don't have to carry it from the start, and what isn't needed can be left behind. Uh, protein? Not nearly enough. I struggle with lunch and breakfast on a long trail. Of course it isn't about survival there but it is about what you can carry on your back and hike 20 miles a day. I try to supplement my rocket fuel with jerky, hummus and tuna nut o suspect in Alaska you might lose a tooth trying to eat those things frozen. By the sheer bulk of calories I expect to eat, I should get well beyond the recommended daily intake of protein from the nuts and nut butters. In the past I've tried to carry along tuna, jerky, cheese (which is terrible frozen), even sausage, and I never eat it. It stays in the pack. I've learned what to bother with, and what not to bother with. The key to not losing a tooth or getting terrible mouth sores is to eat slowly. On foot with a little feedbag at my hip, this should be convenient enough. Yeah, way, way, way too much junk and only junk. I think that subsisting on so much junk is why these trips seem like "survival". They don't have to, but if you don't give yourself good fuel, of course you're going to bonk and struggle. Junk food is counter productive for the long term. It's also heavy in comparison to other "calorie dense" foods that give you more bang for your buck. For instance, 3 oz of Snickers bar gives you about 450 calories, while 3 oz of bacon gives you almost 800 (and has good amounts of protein and fat). 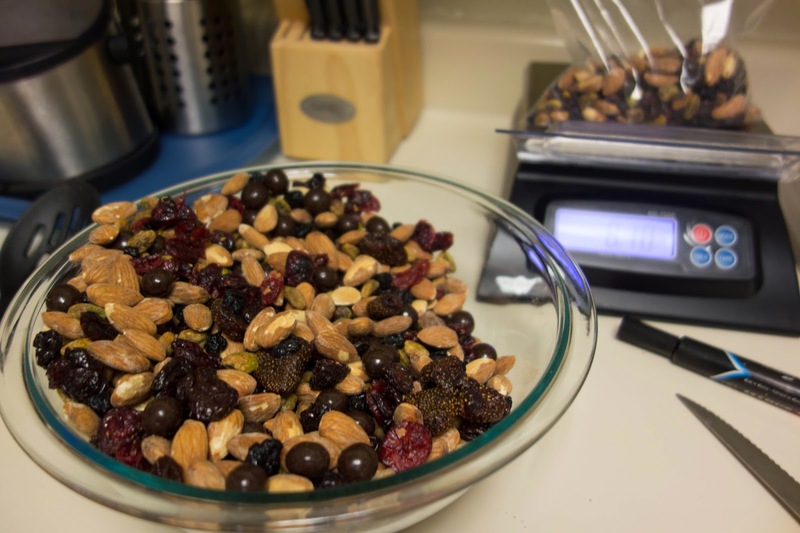 Get a food dehydrator and you'll never go hungry on the trail again! Sugar's all well and good, but protein and fat is the real "survival" food. The problem with protein and fat is they don't lend themselves well to energy, unless you have a long history of training your body for high performance in ketosis. As far as various carbs, I have yet to read any compelling studies that sugar is more evil than any other simple carb. Carbs are carbs. But yes ... I don't disagree with you about dehydrated butter and bacon. It definitely takes discipline to make it work, and most people doing endurance stuff don't use it. Expeditions and backpack trips are different because it's more likely you're getting adequate rest and recovery, and your digestive system might avoid going completely haywire. In this event I plan to stay on the move, have to eat on the move, and have to keep the furnace stoked at all times. Kindling burns easier than logs. I don't expect to finish this thing feeling super awesome, but past experience has showed me as long as I get the necessary calories down and keep them down, my body will be fine for the 7 to 10 days it will take. When I was "meal-planning" the junk food diet, I actually did look up nutrition info for a lot of this. From a purely carb-fat-protein ration, it's more balanced than it looks. Limited nutrients, for sure, but not enough to cause adverse effects in one week. Also, I'm one of those people who despises bacon. I couldn't help look up the comparison because so many people recommend it as a miracle food. Almonds have a better macronutrient ratio, similar calorie density. All of this talk makes me want to go home and eat a salad!! What you mean what works for you works for you and might not be the same as what works for me? The best diets are individualized? There's no magic button? What the heck kind of crazy talk is ths?? That trail photo looks horrible. I think that for me and my super fragile arm, DNS at the Little Su is a REAL possibility if there's no substantial snowfall between now and race day. I'm all about the sugar diet too. Do you use electrolyte tabs such as Nuun or supplement your water in any way? I usually carry a small supply of salt tabs on all of these multi-day races, but I rarely use them. In shorter, faster races in heat I generally take a lot of salt, but it doesn't seem to be important for me at slower paces, especially in the cold. I did cramp frequently during PTL, but I think my muscle cramping is more often caused by overloading certain muscles than nutrition deficits, as I tend to only cramp when I'm hiking up steep inclines, and almost never cramp while running. But I'm one of those that believe salt is overprescribed to runners, and should be taken more based on personal cravings or inclinations than trying to adhere to a set formula.